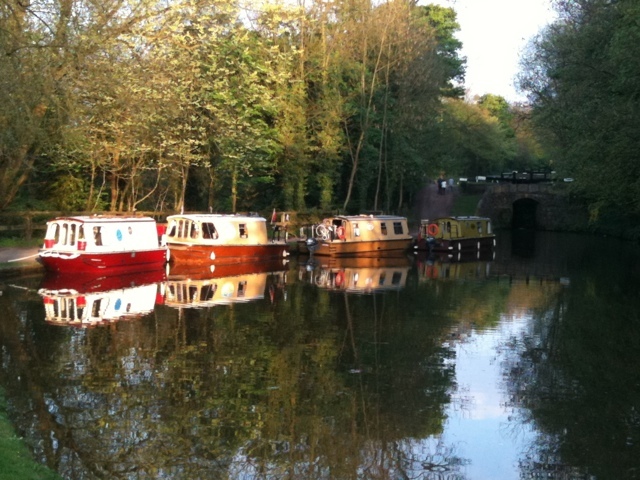 An easy first afternoon, the last two boats cruised up to Bugsworth where the boats all met up. The last time many of us were here was Easter 2005 when the basin was having it’s re-opening celebrations. Today much quieter with easy access to the Navigation Inn!! Up to a bright morning and a fried breakfast sitting on the bench helpfully provided alongside our mooring, in the warm Spring sunshine. 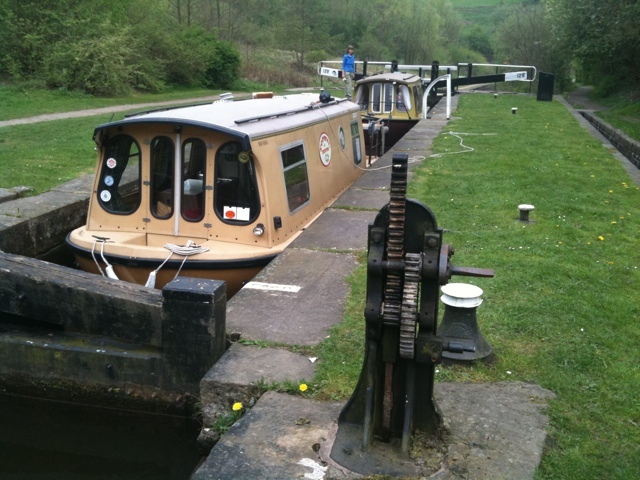 A quiet days cruising planned from Bugsworth Basin to the bottom of the Marple flight of 16 locks. A visit to Tesco at the Bugsworth jcn was a necessity to top up with petrol, hot cross buns and food for our first BBQ. 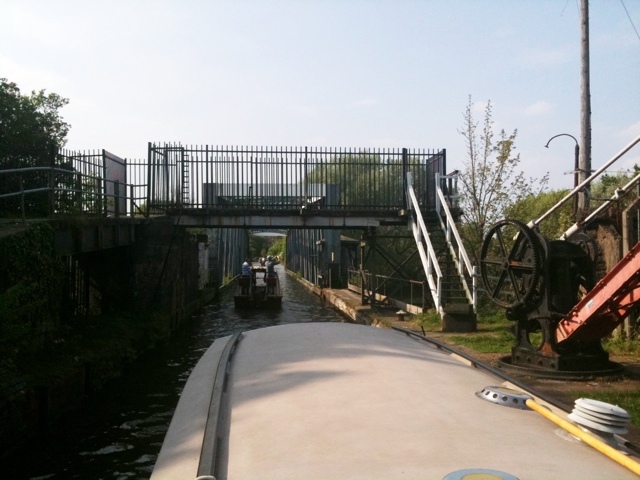 Then a quiet cruise through swing and lift bridges to the top of the Marple flight. It appears that most boats turn left at the junction and head on down to Macclesfield, so we were the exception in turning right and descending these deep locks. The bottom gate gear was stiff and really needed more lubrication especially on the oil points and to the rear of the racks. Some liberal spraying with WD40 helped some as did the use of a longer armed windless. A nice BBQ with our friends at the bottom of the flight in evening sunshine completed the end of a very pleasant days cruising. On towards Portland Basin/ Dukinfield Jcn, 7 level miles and a couple of tunnels. These say on BW signs that they are “two way” working, which doesn’t to us seem the right term as they are only wide enough for one boat at a time, working one direction at a time, perhaps it should be “two way alternate” working? 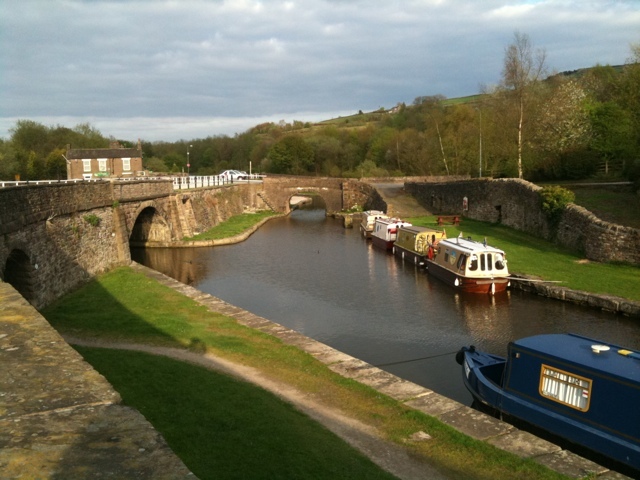 After a quick stop for food at Asda at the start of the Huddersfield Narrow, we started to work up the canal towards the summit. We know we cannot go through the tunnel as our boats are made from GRP and have petrol engines, so we just want to experience this canal that we haven’t been on before. We reached Mossley at 6pm and on seeing that the pub stopped serving food at 8pm we decided to call it a day. After a very nice meal and beer in the Roaches Lock pub we retired for the night. With some planning to walk up to the tunnel first thing before we return to visit the Dukinfield museum tomorrow. Started from Mossley at 10.30 once the energetic amongst us had walked to the tunnel and back. It was a bright and sunny day. Going down we hoped was going to be easier than coming up. Whilst the bottom gate paddle gear was greased, the backs of the racks were not and a long handled windlass was needed to make any progress with the stiff gear on some gates. At the sanitary station we found a stationary boat and he was working down single handed. So we sent one boat down with him and managed to get the other 2 Beavers and the Otter in together. 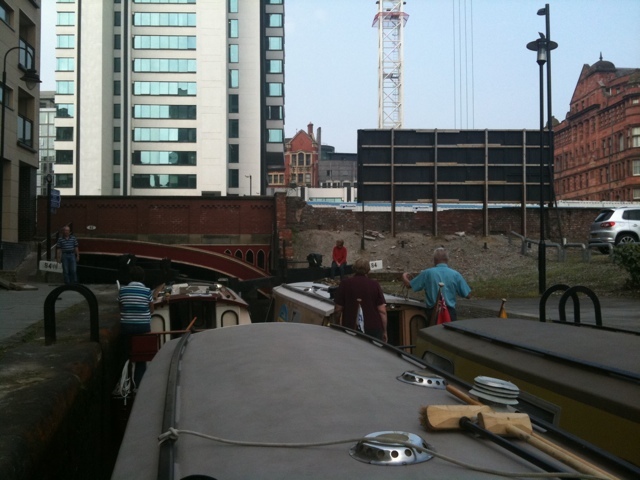 We travelled like this to Dukinfield junction where we arrived at 3pm and moored at the museum and went to look around. We had an evening of sitting on the front of all our boats enjoying G&Ts, the odd beer and nibbles, our dinners cooked on board and good conversation. We settled down for the night there to the sound of people in a flat trying to out do the sound of the local geese! Geese were quiet till dawn when they acted as an alarm clock. Which was good as we planned to leave at 7.30am to get on down the Ashton by lunchtime. Managed to get out of the compound with a gate key loaned to us by a guy from the Historic Wooden Boats Society to take some early morning photos. Then off down the Ashton. Nice run but quite a few locks had paddle gear problems. Especially No16 which was down but the top towpath side one was stuck fully open. Had a bit of a problem contacting BW about these lock problems as the local NW office number in the Nicholsons guide was answered by a guy who had been allocated the number after the BW office might have closed. When we rang the main BW Customer service number, a recorded message apologised for the delay, said they were only a small team, suggested you emailed them and rang off. We all collected a fair bit of plastic on our props. Arriving at lock 3 found that building work was causing problems by the contractors over pumping out the pound causing steel narrow boats ahead of us to ground or not even get over the top cill of lock No2. Once through the last lock, we stopped for some well earned lunch. After lunch we moved just a couple of hundred yards into some private quiet BW moorings in amongst some houses on the left (heading towards the Rochdale canal) in the “Piccadilly Village”. 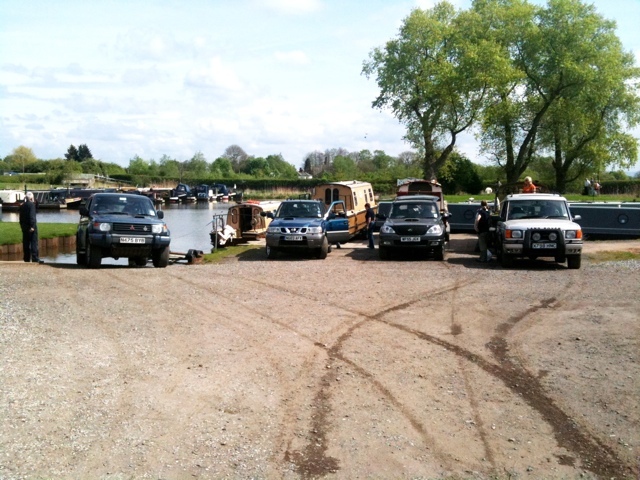 Just big enough for our 4 boats, these are secure moorings as you need the access code you get through the gates. We were given it by a resident. Very handy for the Piccadilly and Arndale shopping areas of Manchester. In the evening, we went to get a meal at the Wetherspoons in the centre of Picadilly. 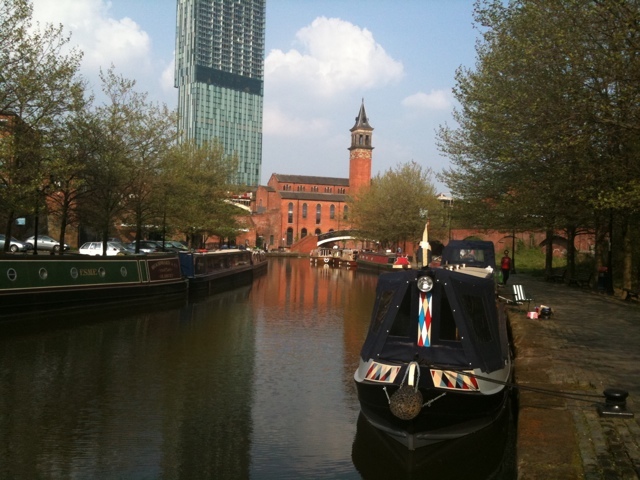 After a very quiet night we moved on down the “Rochdale 9” and into moorings in the Castlefield arm at the end of the Bridgewater canal. Some engine problems, severe backfiring and lumpy running on Tophyl. A change of CDI unit made no change. After a talk with the Yamaha importers technicians, we hope were finally cured with a new set of spark plugs. We shall see tomorrow! Great moorings, but busy. Very handy for the excellent MOSI museum, which takes more than the time we have available to visit. The day was completed by visit to a very nice and reasonably priced buffet style Chinese meal near to China town, about 15 minutes walk away. A quiet morning before leaving at 11am. 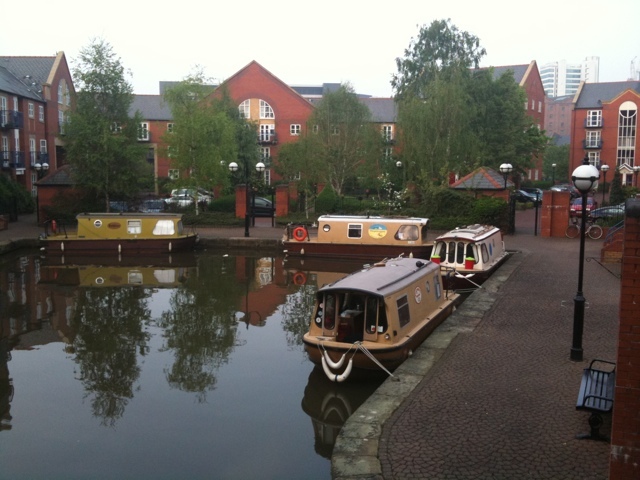 We have a target to visit a supermarket near the Trafford Centre as that will be closer to any provisions available near the moorings. 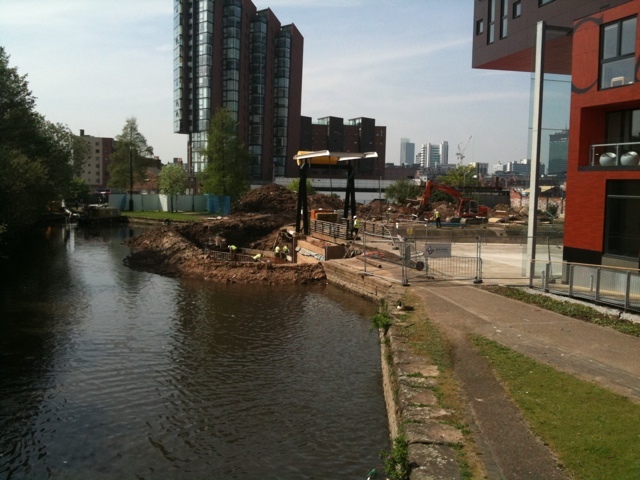 Over in the other arm of the canal, someone has set up Manchester Beach with sand, benches, tables and straw covered hut bars! A quick visit to the sanitary station which is in front of a building covered in a printed image of what it will look like when completed. Strange! 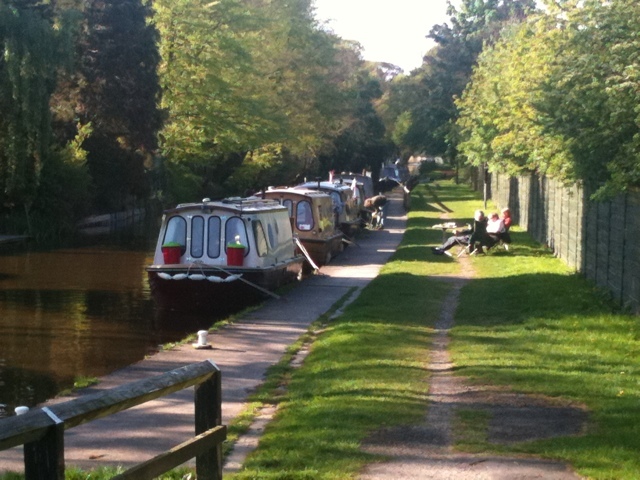 A cruise out past Manchester United’s Old Trafford ground then hang a right towards the Barton aqueduct. But before getting there, we stopped at the massive shopping centre with marble statues and fountains. Nice to see security and CCTV monitoring the moorings. 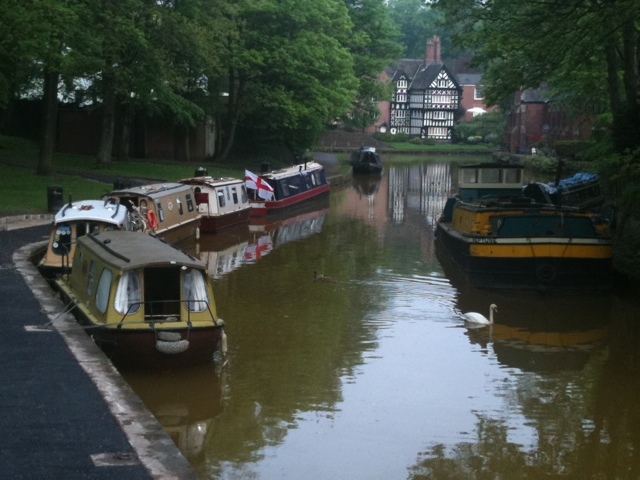 Then over the aqueduct and on towards our overnight moorings at Worsley. Whilst having our “al fresco” dinner we were interrupted by the first rain of the week. No worries though, all on to the “committee” boat Snapdragon. Quiet mooring overnight and the rain has cleared away. Then we assemble for a group shot in front of that famous black and white house at the entrance to the Delph mines. 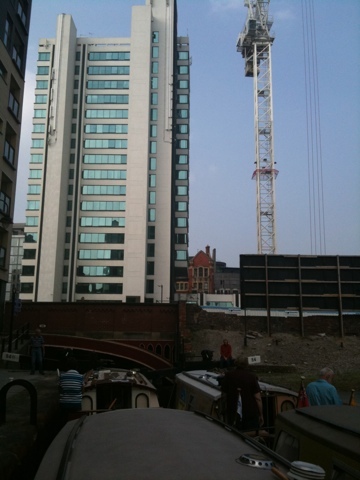 Then on towards Leigh and then on through Plank Lane lift bridge. A cool wind today and not much sun, so we called a halt at Dover Lock Inn to warm up. 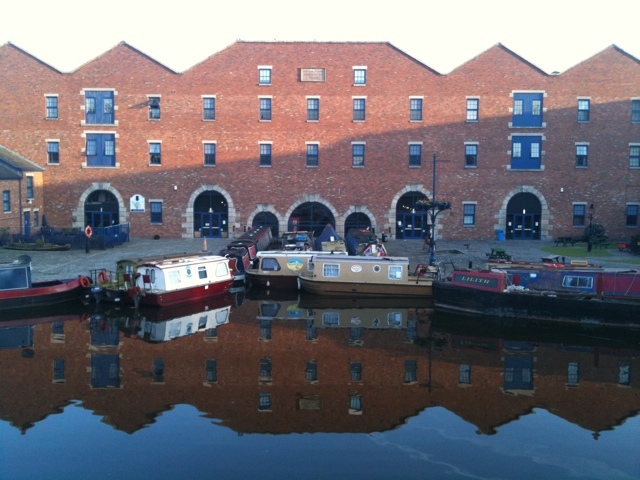 Then on up to Wigan, up 2 locks and then down past BW’s North West HQ on the last leg of our Easter journey. Moored up a few hundred yards past bridge 47 Crooke Bridge. Another group meeting to taste apperitives and nibbles. Cool tonight so for the first time since the start of the holiday, stoves were lit. 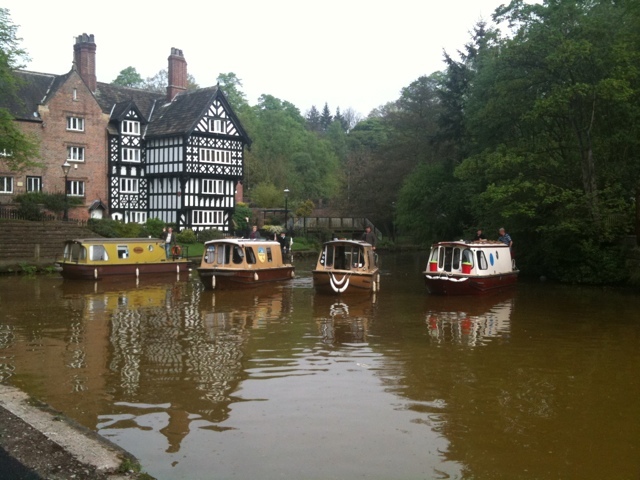 Last full day of cruising tomorrow as we head for Rufford to pull out. Our final day’s cruising starts with the sun out and the birds singing. 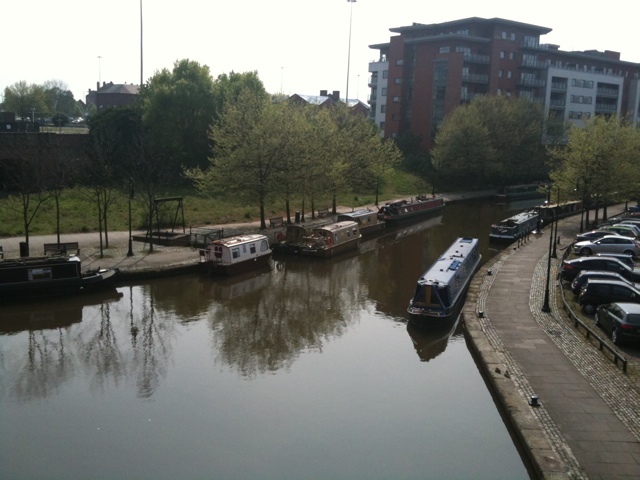 A quiet night’s sleep only disturbed by the party disco boat out from Wigan pier. Off we went only to hit a queue at the first lock, which was OK as a couple of boats needed water. Then on through the last couple of locks on this section with some nice friendly narrowboaters and some not so friendly ones, who did not help to set the lock even for their own boat or say thank you to those who did set it for them but thought everyone else was an plonker! Sometimes there appears to be a direct correlation between the shinier the boat and the more unfriendly the occupants. Then a nice break in the sunshine for lunch on the towpath, only disturbed by some inconsiderate cyclists who seem to think the towpath is a motorway for bikes and should be ridden at that sort of speed, ignoring how dangerous it could be for the families with young children out walking and other users of the canalside. After lunch on down the Rufford branch with some very slow filling locks especially the top lock, which still has a broken paddle, a year since we last saw it in this state. Finally we arrive at the public moorings, with an hour for aperitifs. The crews are all going out to dinner at the Hesketh Arms pub, 10 mins walk from the public moorings by the 2 Rufford marinas. Home day:-( Up early to meet the taxi booked to take us door to door back to New Mills for less than than the cost and the time that it would take by train. Left at 7.45am and reached New Mills at around 8.45am. Cost £65. Left to travel back, but with some to get fuel and lots of traffic lights on the road into Stockport, we soon got split up. Once we all reached the M60 and M62, it was an easy run back up the M6 to Rufford and everyone arrived back within a few minutes of each other. Space had been reserved so that we could all pull out easily on this good slipway. Then time to fasten everything down, say goodbyes and then off home. A big thank you to all, John & Sandra and Pat on Bobbles; John and Carol on Snapdragon; Adam and Jane on Sloe; and Bill and Ali on Tophyl for great company and a lovely week’s cruising. And especially a very big thank you to John Parker for all the organisation he had put in to make it happen, and especially for the great weather he organised too! !